For those born February 9, 1957. 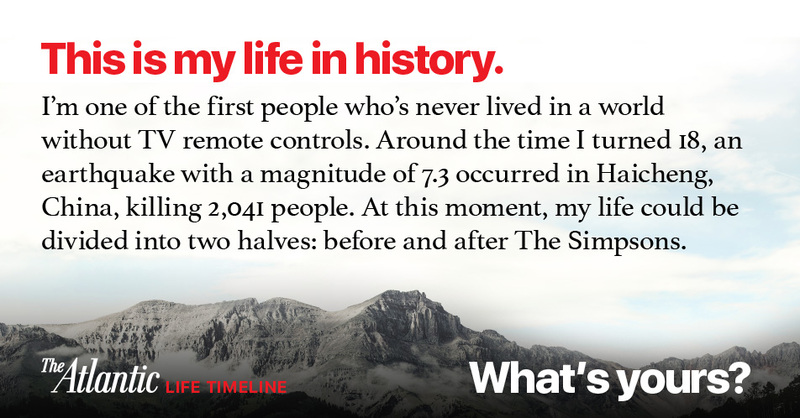 You're one of the first people who's never lived in a world without TV remote controls. In August 2014, Caetlin Benson-Allott wrote about the innovative history and evolution of the remote control. Around the time you were born, Dwight D. Eisenhower was inaugurated for a second term as president of the United States. In August 1964, Eisenhower wrote about George Catlett Marshall. You were born in February of 1957. This year, The Atlantic celebrates its 160th birthday, making it 3 times as old as you. The year you were born, Nora Johnson wrote about the inaccurate criticisms and unrealistic expectations college-educated woman faced in America. At 12 years old, you were alive to behold people walking on the moon. The Partridge Family premiered in 1970. Around your 18th birthday, an earthquake with a magnitude of 7.3 occurred in Haicheng, China, killing 2,041 people. In June 2011, Judith Lewis Mernit wrote about new techniques for predicting the next big earthquake. In 1989, Spike Lee , who was born the same year as you, released Do the Right Thing, which was later nominated for an Academy Award for Best Original Screenplay. In February 2015, Sam Fragoso interviewed Lee about Ferguson, getting tenure at NYU, and the eclecticism of his film Da Sweet Blood of Jesus. When you turned 50, you watched humankind reach the outer solar system. By the time you turn 67, experts at the Pew Research Center warn that there will be no "surveillance-free spaces." In December 2014, Adrienne LaFrance wrote about how the way we see privacy will change over the next decade.